Well that’s it, England are eliminated from the World Cup and my money is on Germany to win the tournament. England may not have the footy skills to match the likes of Germany, but when it comes to brewing there is plenty of skill on offer to rival them. Take this wheat beer for example, a Sussex take on a German classic that has and does everything you’d expect it to. 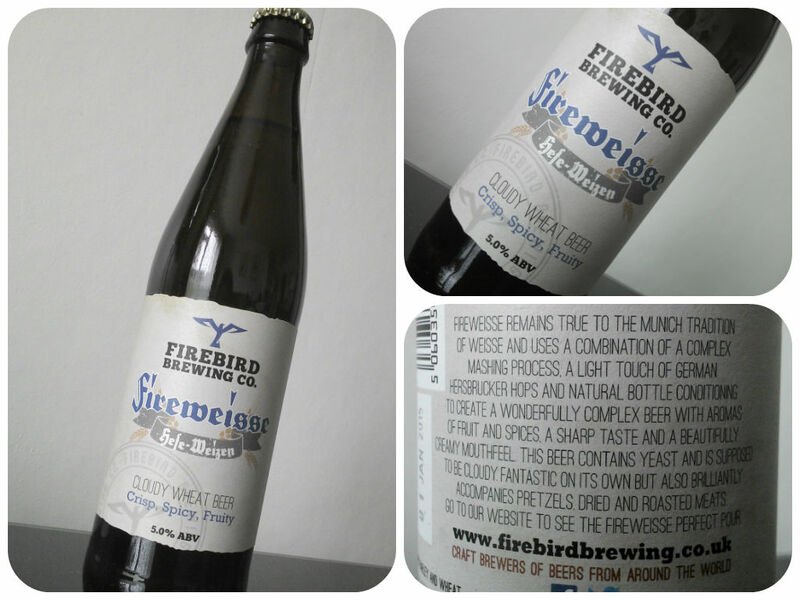 The bottle stands tall, with the clear stamp of Firebird on the label- the recently opened new microbrewery of master brewers Bill King and Richard Peters. Their mission is to create the finest examples of beer styles from around the world and this certainly is a fine example indeed. It pours perfectly hazy but with a vibrancy still showing through and it looks fantastic. On the nose are the classic aromas of spice and banana with a little shy bubblegum sweetness popping in underneath and a delicate lemon note wisping through. Take a sip and receive a carbonated, crisp, refreshing mouth-feel with a surprising velvet quality that develops to coat the palate. Spice and banana again are at the fore with a shier, chewy bubblegum developing later, transitioning through to a more honey-like sweetness that edges in but never overpowers. The finish is a dry balance of bubblegum, honey and fruit with the delicate lemon from the aroma wisping in at the final second in what is a very moreish, very accomplished Sussex Weissbier.